I am a proud Brand Ambassadör for IKEA U.S. This is a sponsored post. One of the things I love the most about our house is the open dining area that’s right off the kitchen. When we bought our home I dreamed about everyone gathering around a large dining table, enjoying holiday dinners together. Flash forward to today, when I’m prepping for Thanksgiving and getting ready to see those dreams come to life! Only one thing was missing, a large, gorgeous table, and chairs. My husband William and I headed out to our local IKEA to browse the selection, wanting to find the perfect fit for our family. 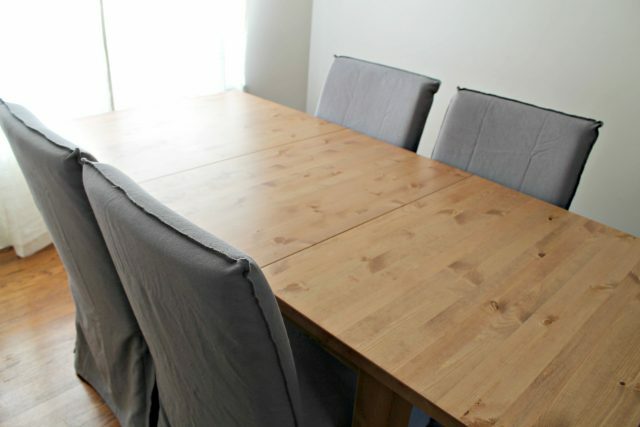 We knew we wanted a large table that could expand to accommodate our family, and we fell absolutely in love with the STORNÄS Extendable table in a gorgeous antique stain. Seriously, it was love at first sight and actually stopped me in my tracks. Plus, the leaves of the table can be stored underneath when they’re not in use! For the chairs we chose these gorgeous HENRIKSDAL chairs in a rich grey. 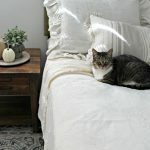 They are perfect for us because they’re extremely comfortable and (are you listening fellow mommas) they have washable covers! After our table and chairs were put together (which was so simple), we were ready to start decorating! I found so many incredible holiday items at IKEA that will carry us over to Christmas. And I just can’t wait to show you! Are you ready? 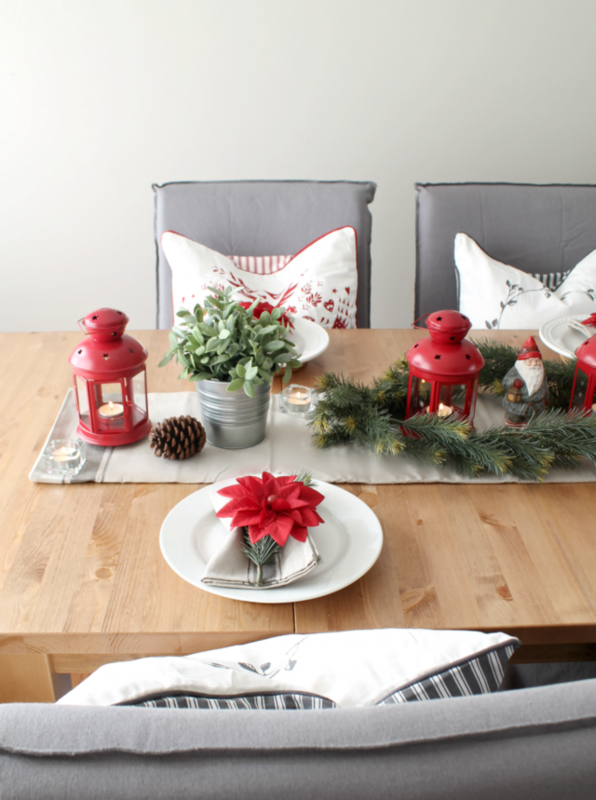 I fell in love with the IKEA VINTER 2016 collection, and loaded our table up with so many of the festive items. I wanted each seat to be cozy, so I added VINTER 2016 Pillow Covers to FJÄDRAR Inner Cushion for each seat. I really love the way they pop against the deep, warm grey of the chairs. I loved the look and versatility of the VARDAGEN tablecloth, it was one of the first things I picked up for our holiday tablescape. I folded it to be used as a table runner for this setting, but I love that I can also cover the entire table with it. Plus, it washes up nicely, too – so I don’t have to worry about the kids spilling on it, etc. 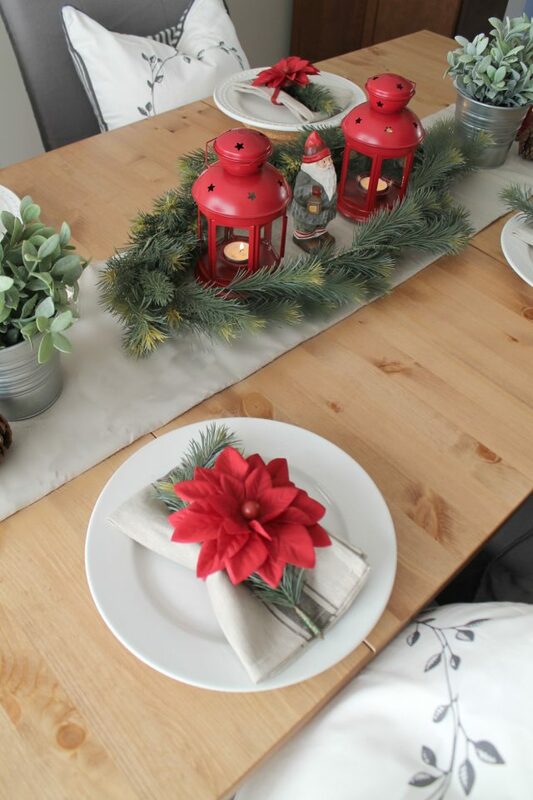 After I laid down the tablecloth, I started to create a base of SMYCKA Artificial Garland. This garland is great because it’s easily moldable to fit your table decor, so I was able to size it perfectly for what I needed. After I had that on the table I began adding in those adorable ROTERA lanterns that you see. How pretty are those pops of red?! I placed GLIMMA tealights in the lanterns and scattered them around the table for that warm, comforting glow that candles offer. It really sets the ambiance of the room when they’re all lit. A few FEJKA artificial potted plants in their SOCKER plant pots really helped to tie everything together. We also added two SMYCKA artificial wreaths to the walls of or dining area to make everything cohesive. 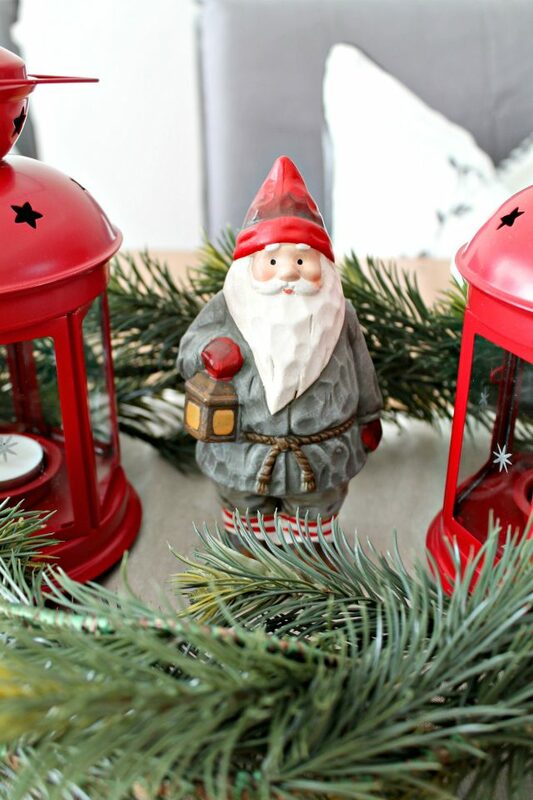 And, of course we needed this adorable ceramic Santa Claus to make our holiday table complete! Isn’t he sweet? 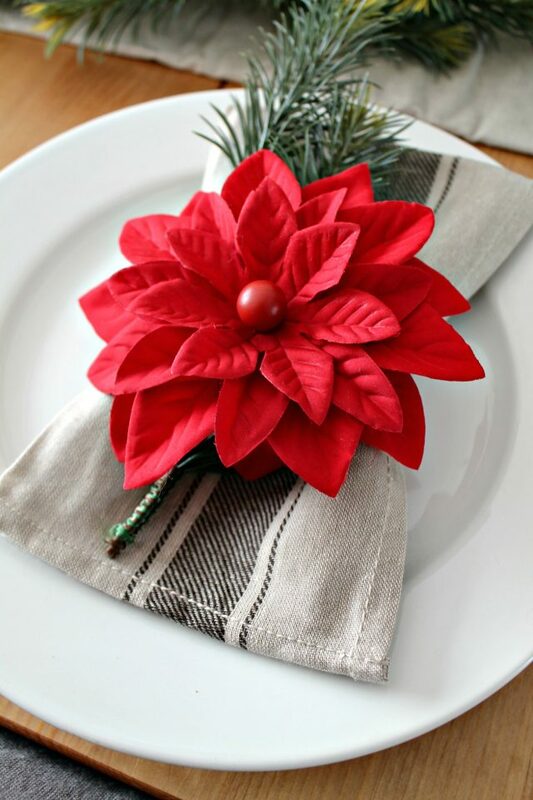 We topped our plates on the table with the VARDAGEN napkins, these gorgeous napkin holders, and a small sprig of spruce, I really love the way it looks against a plain white plate. So simple and yet so pretty! 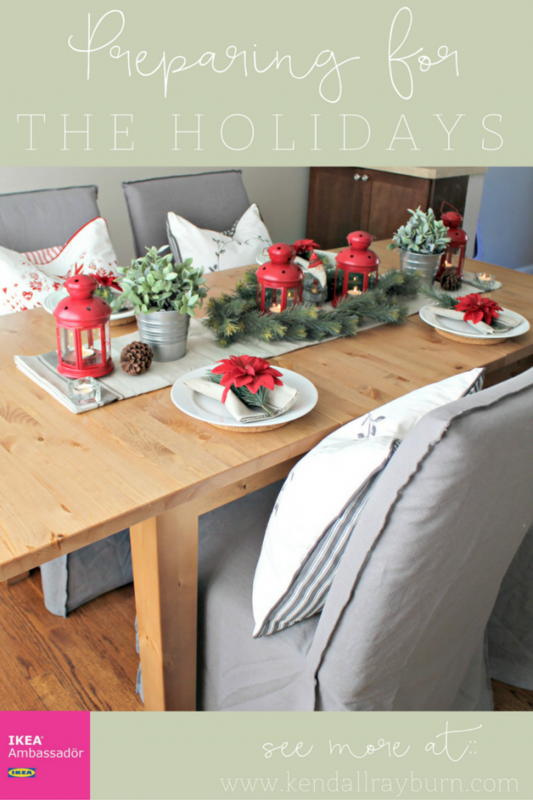 I am just loving how everything came together in our dining room, and I can’t wait to have my family here to enjoy a great holiday meal together! So, what do you think? Everything came together nicely, right? I’ll be sure to share more photos on my Instagram so you all can see how this gorgeous table grows and changes with our family! If you need great family furniture pieces, or holiday decor, be sure to check out your local IKEA (here’s a store locator) or shop online! We are proud to shop IKEA because they design for everyone, it’s called Democratic Design. Everything at IKEA has the right combination of form, function, quality, sustainability, and it’s all offered at a low price. IKEA helps families like mine save big on what we need the most in our homes, and it’s because of that, that I am so very proud to be an IKEA ambassador for 2017! What does your holiday table look like? That table is STUNNING! I love the wood! 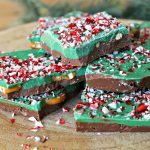 So perfect for the holidays! I’ve never been to Ikea before, I want to go so bad! This is perfection! I didn’t even know IKEA had so much stuff like this. 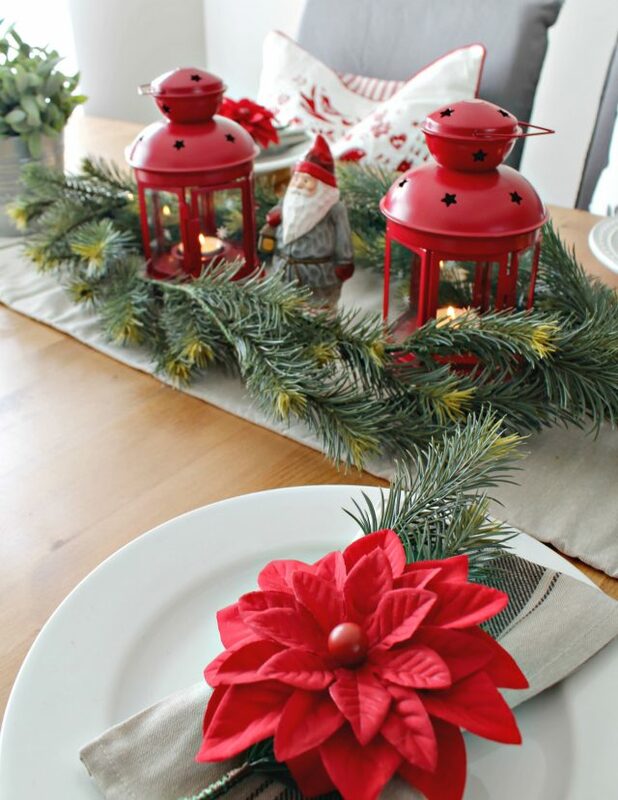 I am totally gonna go head to my IKEA and grab those lanterns and garland- perfect for the holidays!! This is exactly the holiday look that I’m going for!!! Love the greys with the reds – very festive but also so calming. Welp, I definitely know where I am going for my next round of Christmas decor! WOO! Gorgeous! I LOVE IKEA so much, I miss not having a store near me. Oh wow. That is a wonderful tablescape! 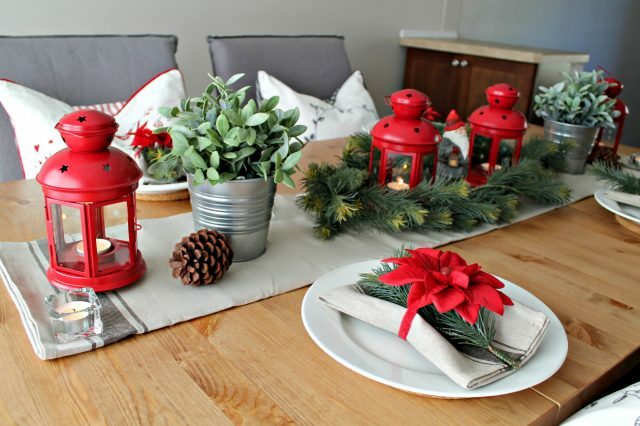 There is nothing like a fantastic decor feel to brighten up the holidays. And, I need to head to ikea. Insert all the heart eyes here! That is absolutely gorgeous! I had no idea Ikea had so many smaller decorations. You did an absolutely amazing job. Love the whole set up! That table looks great too. Love your chairs. Makes me wants to sit and eat a meal there! Sooo glad Ikea isn’t too far from me… cause I know where I’m dragging my boyfriend this weekend! I love Ikea. 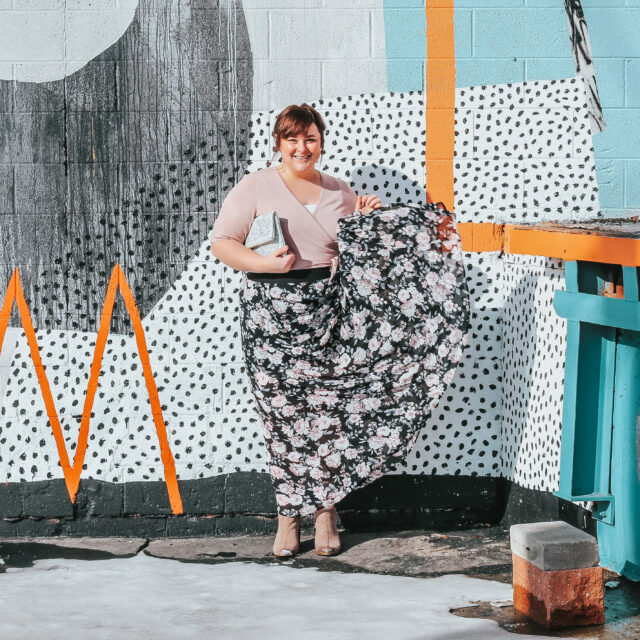 They have such great items and so much to choose from. These are beautiful Christmas decorations. First of all I LOVE IKEA and their holiday stuff is always so cute! Your table looks absolutely beautiful, come do mine next! I love Ikea. I wish we had one where we live. Your table is gorgeous! This set up is stunning! I’m in love with how you put it all together! I’m due for an Ikea trip! I love their stuff and love their prices even more. They have some great pieces for the holidays. The table is adorable and I love the decorations around it as well. The pillows are perfect! Sharing on my FB page later this week! Your table is beautiful! I love those throw pillows, too! So pretty and festive! What a beautiful table setup. All the decorations are adorable. I wish there was an Ikea near my place. So simple yet beautiful! I love the Santa! So pretty one of the best settings I’ve seen so far! This is so fab! I LOVE IKEA. I was so excited when we moved to one only 30 mins away instead of 3 hrs each way! All of those picks are lovely! I love the color combination as well. It’s very simple and elegant. This is definitely the kind of decor that I would go for. I used to love going to Ikea in Illinois but since we moved to Iowa, there is none nearby. I wish there were, we used to spend days in that store shopping, it was so much Fun! This is such a beautiful simple look! 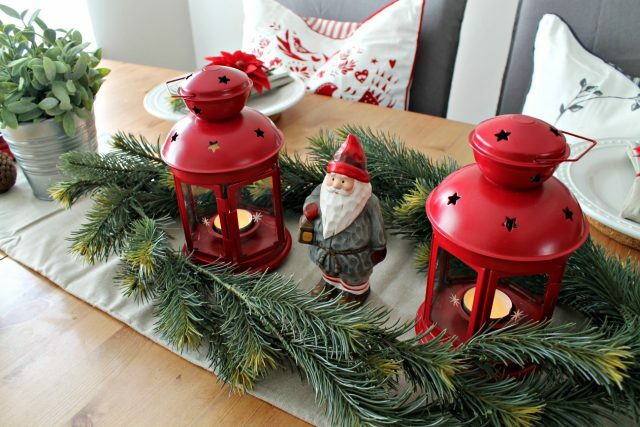 I can always count Ikea for some unusual pieces- that Santa nome is adorable! 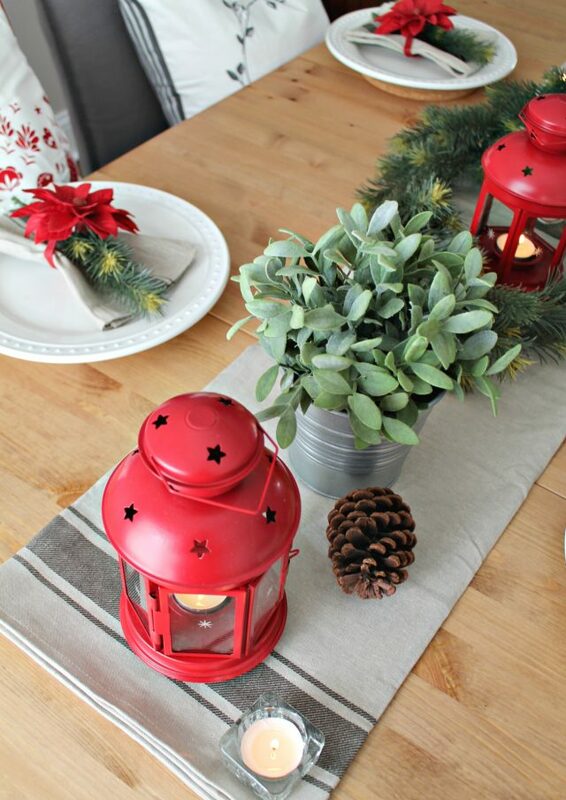 Love the red lanterns on the table! Ikea is about 15 min from me and it’s just dangerous to have access to so much cute, affordable decor! Your table setting is so cute! I absolutely love the color red and so this is beautiful to me. I LOVE this! 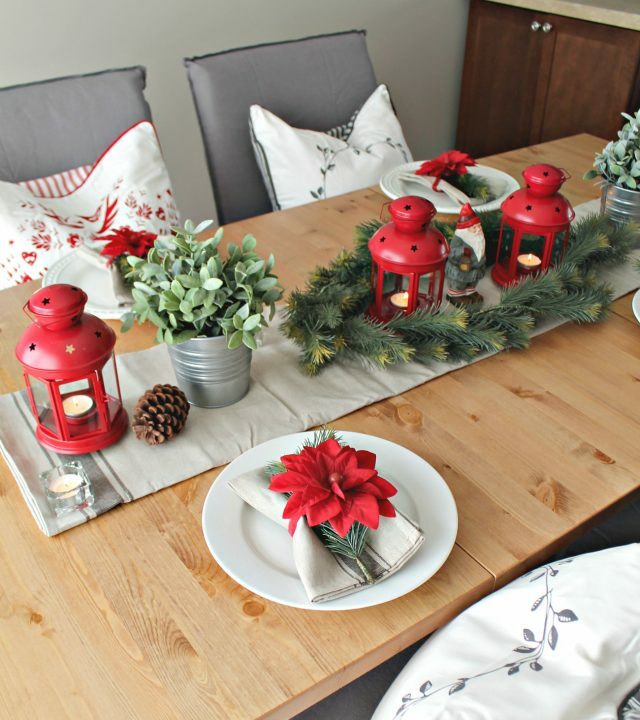 I saw those Santas at IKEA and didn’t even think to use them in a tablescape! Great idea. I want that table! 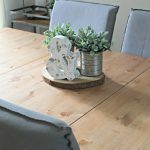 This is the table I have been telling my husband I want! I love how simple and pretty your table is! I am in love with your dining room table! It is gorgeous and the tablescape is simple but elegant all at the same time. Gorgeous ! Those are all such nice decor. It looks so beautiful. I wish my dining room looked this nice! Wow reading this post really put me in the holiday spirit! 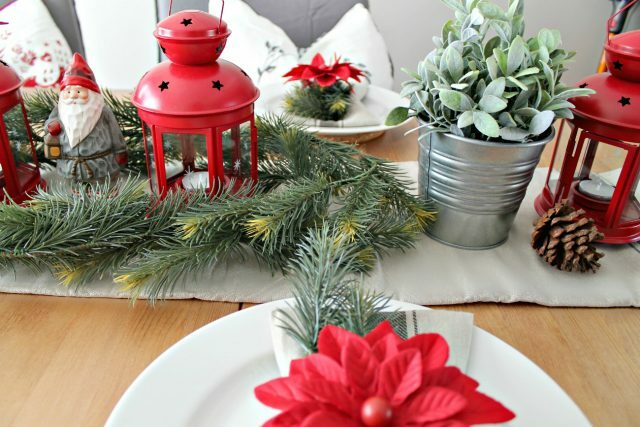 I love ikea and I need to consider them when getting my holiday decor! I love this! I really like that ceramic Santa! I need to do something similar to this for my table! This is a great Holiday look! 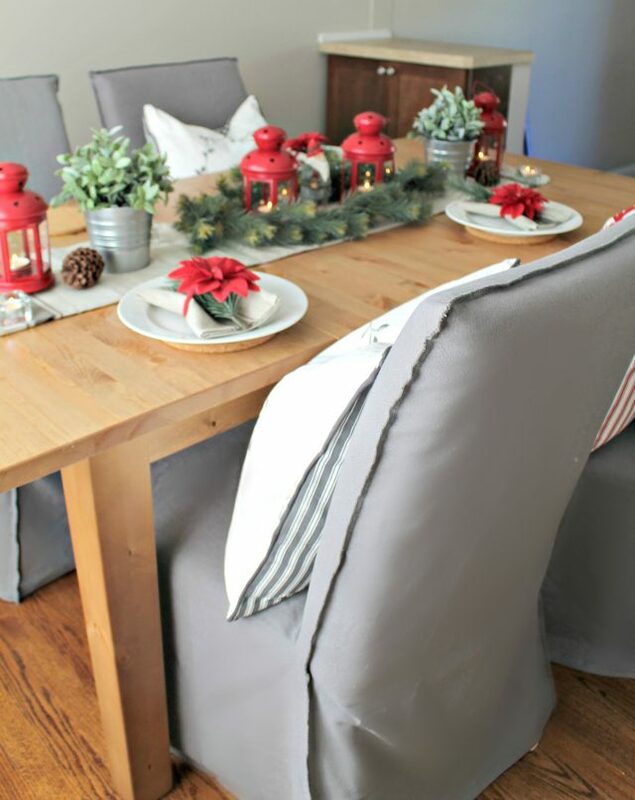 Love the greys with the reds – very festive but classic! Your table setting is so beautiful! 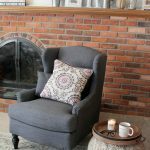 These are the first holidays in our first home, so all of the decorating and planning is brand new to me! I love it! I love your table. When we bought our kitchen table, 8 years ago, I remember it being a tough decision. We went to a ton of stores before deciding on one. I wish we had an Ikea close to our house. But then again, it might not be a good idea. I want some new decor. Your table looks so amazing! I love shopping at IKEA. We find great deals and long lasting products. I need to stop in to my local one very soon. This table is gorgeous! I love all of the plates and decorations and the stain is awesome! I absolutely love IKEA and their modern looking furniture! 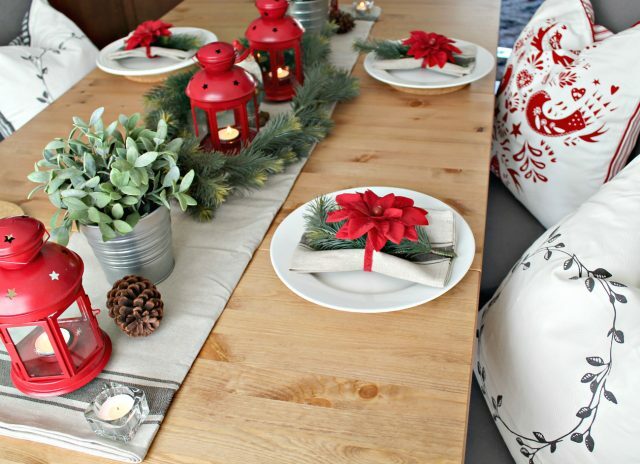 I think you did an amazing job decorating your dining room for the holidays! So perfectly festive! What a beautiful display! I love doing up my table with placemats, etc. It is always so much fun, especially during the holidays. Everything looks so beautiful! I love Ikea and I know that I will find great stuff at great prices.